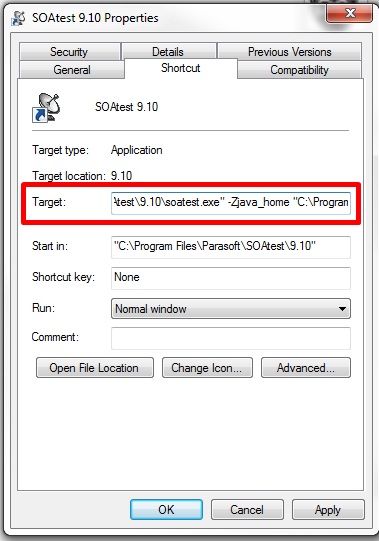 How to Change the java versions in parasoft soatest 9.9? I am running my soatest 9.9 version with java 1.7. Now i have a requirement to run the java code (written in 1.8) using my soatest 9.9. I am getting problems with some or other versioning. What are the steps to follow to successfully change the java versions with out messing up things. If you wish to use your own JDK, you can do add "-Zjava_home " to your command-line arguments when starting your Parasoft tool. Note the double quotation marks! Thanks for the info, yes i can setup this but didn't worked out. so I downgraded my java version to 1.7 to make it work for the time being. Make sure that you put a space between -Zjava_home and the quoted path to the JDK or JRE folder. I tried same kept Zjava_home as below, however getting "Version 1.7.0 of the JVM is not suitable for this product. version 1.8 or greater is required"
Using a newer version of Java is generally OK whereas trying to downgrade may or may not be supported. Java 7 has been EOL for a couple years now. So, some users of older versions of SOAtest that included a Java 7 (or older) may need to use a newer Java to be able to load newer Java libraries for scripting or custom extensions. There should not be any reason to go in the opposite, to downgrade the java, because Java maintains compatibility. Note: the reason i have to add this jar files in "parasoft> preferences> system property" is, to submit certain logs using JMS transport. another reason is i have opened my workspace on 9.10 so it won't work to open backward in 9.9 so i need to find out a solution for this.